IDF changes plans to write 'fallen in a terrorist attack' on tombstone of soldier who fought terrorists bare-handed after wife's appeal. The Israeli Defense Ministry announced Monday that it would recognize an off-duty soldier killed fighting terrorists in a supermarket as having "fallen in battle." But his wife Yael was shocked to find that the IDF had decided it would inscribe on his tombstone merely that he had "fallen in a terrorist attack," seemingly downplaying his incredible heroism. "But who decided? Why was it decided? Under whose authority? Yet nobody can answer me. I was never asked by anybody. I was there by your side seconds before you ran to save the lives of others. "If that was not a combat fight then what is? Somehow you can fight a terrorists with your bare hands, but if it is during shopping and you do not wear your uniform, it is not defined as 'battle'." Now, following his widow's direct appeal, the IDF has said it would change the wording to read "fell in battle." Addressing the topic, IDF Chief of Staff Major-General Gadi Eizenkot said that "the IDF's position on the incident in which Staff Sergeant Tuvia Yanai Weissman z"tl was killed is that it was a battle - and that is part of our obligation to Yanai as a warrior, to his family, and to the IDF ethics of combat." 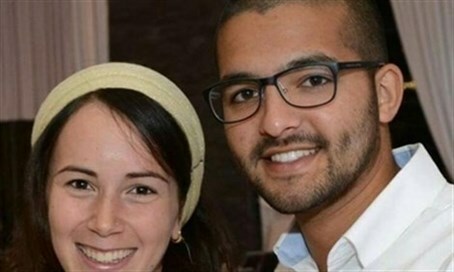 "The fact that Yanai tried to tackle the terrorists and neutralize them with his bare hands until he died - (this) expresses his courageousness and the fact that for him, the scenario was (nothing less than) a battle with terrorists."